Description: We are at a pivotal time in human history. Please join the National Coalition for Mental Health Recovery (NCMHR) and the International Association of Peer Supporters (iNAPS) in the first in a series of webinars where we explore the relationship between ecology, how we relate to one another and the earth, and healing from crisis. We have gathered experts from around the globe, including indigenous peoples, to speak to this topic, share best practices, and propose some solutions to the very complex problems we face. 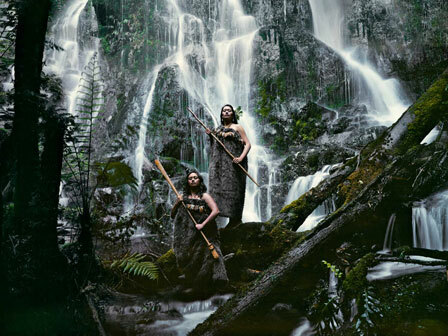 Rangi Ahipene - Rangi is a Maori Chief who lives and works in Tauranga, New Zealand and brings an indigenous perspective. Rangi has been recognized for his transformative work with youth for a Maori organization called Te Tuinga Whanau. Jode Freyholtz-London - Jode has worked in the human services field for over 30 years. Her career has focused on mental health services in rural areas of Minnesota. Jode founded Minnesota’s statewide consumer-run mental health organization, Wellness in the Woods, Inc. in March 2013. She has served on the Rural Health and Primary Care Advisory Council, and presently serves on the State Mental Health Advisory Council. Jode was recognized for her work last year when she was named the Rural Health Hero of 2017 by the Minnesota Department of Rural Health and Primary Care. Reverend "Luke A. Shootingstar" Walters - In his work, Luke identifies with the roles of Visionary Artist, Peer Wellness Specialist, diplomatic Ambassador, and Universalist Minister. Luke is the Chief Executive Officer of the Mutual Benefit Society, founder of Global Community Designs, and a member of numerous government advisory councils. Luke draws on his lived experience in all his work, planting seeds for peace and initiating ripples of wellness throughout the world, engaging a myriad of communities in the spirit of hope that others may come to similar restored empowerment and rediscovery of their own purpose in life. Self-direction is a model for organizing supports in which the participant manages an individual budget to purchase for a variety of services and goods used to facilitate their recovery journey. Bevin Croft, MPP, PhD – Research Associate at the Human Services Research Institute. The research that has been done, preliminary results here and in England. Future directions in research and funding for research. Julie Schnepp – has participated in the Consumer Recovery Investment Fund Self Directed Care Program for the last seven years. During this time she has become a Certified Peer Specialist with additional training in working with youth and young adults, older adults, forensics, LGBTQA+ and more. Pam Werner – Manager with the Michigan Department of Health and Human Services in the Office of Recovery Oriented Systems of Care. Moderated by Daniel Fisher, Ph.D. – Co-founder and CEO of the National Empowerment Center. Please visit www.nasmhpd.adobeconnect.com/p4ugoxgw26d to view. Moderator: Dr. Daniel Fisher, the executive director of the National Empowerment Center and the chairman of the board of directors for the National Coalition for Mental Health Recovery. Panelists: William Parke-Sutherland, Executive Director of Grassroots Empowerment Project (GEP), Anthony Fox, Chief Executive Officer of Tennessee Mental Health Consumers' Association and Sally Zinman, Executive Director of the California Association of Mental Health Peer Run Organizations (CAMHPRO). A SAMHSA sponsored webinar presented by National Coalition for Mental Health Recovery took place Wednesday, April 26, 2017 called “Peer-Run Respites: Effective Alternatives to Hospitals." Click here to hear the archive recording (You need the Adobe Connect Add-in installed. If it's not installed, you will be prompted to download it). The Alternatives conference is the oldest and largest conference of its kind, organized and hosted for more than three decades by peers for peers (people with lived experience of the behavioral health system, emotional distress/crisis, trauma, substance use, and/or addiction). The Alternatives conference is renowned for offering the latest and best information in the peer recovery movement, and provides an invaluable opportunity for peers to network with and learn from one another. NCMHR presented these 3 policy priorities, recommendations, and talking points to Congress on our Hill Day, July 31, 2018. PRIORITY 1: Ensure significant peer participation in the development of national and state mental health policies. PRIORITY 2: Develop and sustain alternatives to involuntary treatment by increasing the availability of peer-run crisis respites and other peer-run crisis supports. PRIORITY 3: Protect the human rights of persons labeled with mental health conditions. WASHINGTON (July 30, 2018)—People with lived experience of mental health (MH) issues are demonstrating an empowered, independent voice in Washington, DC, this week (July 30-Aug 3) by conducting their movement's 33rd annual National Alternatives Conference for the first time without Federal support. Building on the theme of their movement for social justice—"Nothing about us without us"—the National Coalition for Mental Health Recovery (NCMHR), which was founded and is run by persons with psychiatric disabilities, is hosting this conference at Catholic University of America. The conference theme is "On Our Own, Transforming the Future Together." Conference chair Anthony Fox, from Tennessee, said, "We are proud to have Bruce Darling of the cross-disability group ADAPT teach advocacy skills to our participants." Members of ADAPT, many in wheelchairs, chained themselves to the White House fence in their protest of cuts to the Affordable Care Act. NCMHR president Daniel Fisher, MD, PhD, said, "For too long, parents and providers have spoken for us in DC. This week marks a new chapter in the lives of people labeled with mental health issues. At this People’s Alternatives, we will speak for ourselves. This week we will make our voices directly heard in the Capital." Mr. Fox added, "We want to strengthen our voice in formation of national mental health policies; create more alternatives to incarceration in psychiatric hospitals, nursing homes, jails and prisons; and protect our civil and human rights." The NCMHR, consisting of member organizations in 27 states and the District of Columbia, proudly joined 14 other disability rights groups run by persons with disabilities as a founding member of the National Disability Leadership Alliance. For further information visit www.alternatives-conference.org or contact Daniel Fisher via our contact form. WASHINGTON (6/25/18)—The National Coalition for Mental Health Recovery (NCMHR)—a coalition of statewide and other organizations run by and for persons labeled with mental illness—strongly denounces the human rights abuses resulting from the Trump administration’s heartless “zero tolerance” immigration policies. “We who have psychiatric labels, many of whom have experienced trauma at the hands of the psychiatric establishment, are horrified by the forcible drugging of immigrant children in U.S. custody with powerful and toxic psychiatric medications. “Although, on June 20, the president signed an Executive Order ending his cruel policy of tearing children from their parents’ arms at the border, we now learn of additional tortures being perpetrated,” said NCMHR board president Daniel B. Fisher, M.D., Ph.D. “Besides being caged and then subjected to placements with records of abuse, the children already in custody are being forcibly drugged with powerful psychiatric medications to quiet their understandable reactions to trauma. These practices will have catastrophic repercussions for the children, their families, and society. The National Coalition for Mental Health Recovery (NCMHR) is a coalition of statewide organizations (representing 26 states and the District of Columbia) run by and for persons labeled with mental illness, and other organizations that support the movement for social justice of individuals with psychiatric diagnoses. NCMHR works to ensure that individuals with lived experience of a mental health condition have a major voice in the development and implementation of health care, mental health, and social policies at the state and national levels, empowering people to recover and lead a full life in the community. Contact: Daniel B. Fisher, M.D., Ph.D, NCMHR Board President via our contact form. As part of the Alternatives Advocacy Pre-conference - Please vote on your top 3 policy priorities from this document. This information will be used to educate Congress on NCMHR Hill day, July 31st. The National Coalition for Mental Health Recovery (NCMHR) announces that applications for workshop presentations for Alternatives 2018 are now being accepted. The Alternatives conference is the oldest and largest conference of its kind, organized and hosted for more than three decades by peers for peers (people with lived experience of the behavioral health system, emotional distress/crisis, trauma, or substance use/addiction). Alternatives is renowned for offering the latest and best information in the peer recovery movement, and provides an invaluable opportunity for peers to network with and learn from one another. This will be a 'people’s Alternatives,' funded entirely through registration fees and donations. We will be ‘on our own’ again, connecting to the roots of our movement. Visit the website: www.alternatives-conference.org for conference registration information, and other valuable information, to nominate potential keynote speakers, and other valuable information. Sponsors are needed for Alternatives 2018. Please encourage organizations or individuals to become sponsors. More information is at the website www.alternatives-conference.org which is updated regularly. We look forward to receiving your proposals and seeing you at Alternatives 2018! Follow @AltCon_2018 on Twitter; the hashtag is #Alternatives2018. And click here to view our Alternatives 2018 Facebook page. This week, President Obama signed the 21st Century Cures Act, touting the bipartisan mental health measure as "bringing to reality the possibility of new breakthroughs to some of the greatest health-care challenges of our time." However, the reality behind this legislation is not quite what it appears to be. The 21st Century Cures Act will increase the ease with which individuals can be involuntarily hospitalized in a locked ward, increase funding for institutionalized settings, and demand that states implement forced outpatient treatment in order to receive funding. Many media reports are suggesting that it will fix a broken mental health system, incorporate patient voices into clinical processes, decrease mass violence and modernize clinical trials. But will it really? Here are seven reasons why Obama's signing of the 21st Century Cures Act is less than grounds for celebration. Sandy Hook and other tragedies will not be avoided by the measures contained in this bill. The "reform" actually sets back many advances made in the 20th century. It does not help people live in the community. No extra money is going towards helping people. Effective treatment is not the focus of this bill. This bill is not based on the advocacy of users of mental health services. Pharmaceutical greed and conflicts of interest underlie everything about this bill. Dear Reps. Upton, Whitfield, Pallone, Burgess, Barton and Shimkus: Our alliance of 15 national disability organizations, all run by persons with disabilities remain opposed to Rep. Murphy' s Helping Families in Mental Health Crisis proposed bill, HR 2646, while we support HR 4435, Comprehensive Behavioral Health Reform and Recovery Act, sponsored by Reps. Green, DeGette, Matsui, Tonko, Loebsack , and Kennedy. Here is a touching essay by a woman who was recovering from "schizophrenia" and was killed by police while holding a pair of scissors. These killings by police of our people must end. Peers in a variety of settings are shown to inspire hope, facilitate empowerment and reduce frequency of hospitalization. The National Coalition for Mental Health Recovery (NCMHR) is pleased to extend a warm welcome to Dr. Anita Everett, who has been appointed Chief Medical Officer of the Substance Abuse and Mental Health Services Agency (SAMHSA). Dr. Everett will head a five-person staff for the newly created Office of Chief Medical Officer. During the course of her psychiatric career, Dr. Everett has gained extensive experience in numerous arenas in the mental health field. She is a compassionate physician, a keen policy advocate, and an inspiring leader for recovery-based transformation of public mental health care. Dr. Everett has shown a great respect for the perspective of people with lived experience. In the 1990’s, at the height of controversies related to patients dying and suffering in Virginia’s public psychiatric hospitals, Dr. Everett served as the first Inspector General for the state's public mental health system. In that capacity, she created teams of mental health consumers who inspected state hospitals and made recommendations for the improvement of care and protection of civil and human rights. More recently, Dr. Everett has served as division director of Johns Hopkins Community and General Psychiatry, Bayview Campus, and associate professor in the Department of Psychiatry and Behavioral Sciences at the Johns Hopkins School of Medicine in Baltimore. Dr. Everett has also served as president of the American Association of Community Psychiatrists and is currently the president-elect of the American Psychiatric Association. Dr. Everett has the skills, dedication, and depth of knowledge needed to build bridges and consensus among stakeholders in the mental health community and among policy decision makers. NCMHR looks forward to working with Dr. Everett and SAMHSA in promoting voluntary, community-based, peer-driven services and supports across the country. Visit www.change.org/p/fda-stop-fda-from-down-classifying-the-shock-device-to-a-class-ii-device-stop-shock-treatment to sign the petition, and to find instructions on how to submit comments. The Recovery Now! Campaign advances innovative strategies to improve the quality of mental health care, promoting recovery for all Americans affected by mental health conditions. Learn more and join the campaign today! As House and Senate Democrats and Republicans focus on comprehensive mental health reform, and a recent poll by the Kennedy Center for Mental Health Policy and Research indicated that 71% of Americans are calling for “significant “ or “radical” changes in the way that mental illnesses and addiction are treated, leading mental health experts and advocacy groups have announced the formation of the Recovery Now! Campaign. The campaign has been created to address the crisis in our mental health service system and the personal crises faced daily by individuals and families in great distress. Click here to read the campaign launch announcement. Our 2017 public policy priorities focus on advocating for a recovery-focused mental health system that prevents crisis, protects rights, and promotes wellness, economic empowerment, and social inclusion. Click here to view our public policy priorities. In 2014, Representative Tim Murphy (PA-18) engaged the GAO to enumerate the programs the Administration funds to assist persons with severe mental illness, to determine the degree to which these programs are coordinated, and to assess the evaluations done on the programs. The GAO identified over a hundred federal programs, but comes to misleading conclusions in its report. Read the GAO report and our position statement (PDF, 120KB, 1 page). Editorial: Does the scientific evidence support the recovery model? NCMHR has compiled lists of references and citations to support legislative advocacy and public education efforts. To access research and citations on Involuntary Outpatient Commitment (IOC), also known as Assisted Outpatient Treatment (AOT), click here (PDF, 157KB, 5 pages). To access research and citations documenting the weak link between mental health diagnoses and violence, click here (PDF, 156KB, 5 pages). To access research on the evidence base for peer support and recovery-oriented approaches to distress and crisis, click here (PDF, 208KB, 13 pages). Under Involuntary Outpatient Commitment (IOC), a person with a serious mental health condition is mandated by a court to follow a specific treatment plan, usually requiring the person to take medication and sometimes directing where the person can live and what his or her daily activities must include. Proponents of IOC claim that it is effective in reducing violent behavior, incarcerations, and hospitalizations among individuals with serious mental health conditions. However, repeated studies have shown no evidence that mandating outpatient treatment through a court order is effective; to the limited extent that court-ordered outpatient treatment has shown improved outcomes, these outcomes appear to result from the intensive services that have been made available to participants in those clinical trials rather than from the existence of a court order mandating treatment. NCMHR Visionary C/S/X Leadership Conference - Audio Recording Now Available! Another lively and inspiring discussion took place this year, featuring Daniel Fisher, Susan Rogers and Wilma Townsend, and moderated by Keris Myrick. If you missed this annual NCMHR event, please click here to access the audio of the presentations.